If you want to see your original heroes from Star Wars act the way you remember them, there’s a very easy way. And according to Lucasfilm, it’s in canon, too. 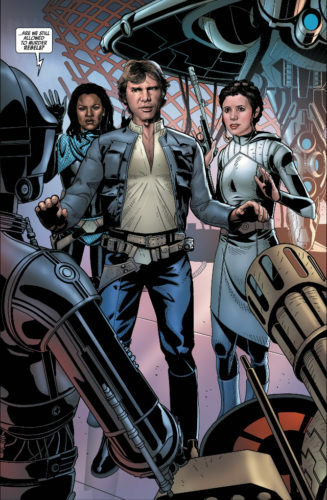 Marvel Comics has been rebuilding the Expanded Universe in their Star Wars ongoing comic (as well as several related mini-series), and most of it has been set in a twilight time between A New Hope and The Empire Strikes Back. Along the way, it’s also planted the seeds for things to go wild and explore darker corners of the universe in ways that the movies have barely been able to do. Though the movies have often alluded to a criminal underground and stories of people outside the fight, cinematically it was really the introduction of Kylo Ren (and Snoke) that made it explicit that the Jedi and the Sith weren’t the only ones able to play around with the Force. In The Last Jedi, Rose Tico and Finn journeying to Canto Bight gave us the notion of a galactic elite who are simply profiting off the conflict between the First Order and the Resistance without really being involved. But the comics have been playing with those notions for decades (both in Marvel and for a glorious period, Dark Horse Entertainment). Case in point, the recent event mini-series, The Screaming Citadel. Combining the regular cast of Star Wars with Marvel’s breakout original characters, Doctor Aphra, the story pits your heroes against the Queen of Ktath’atn, an evil being who feeds on her subjects and collects galactic oddities. Suffice to say the young farmboy who would one day be called the Last Jedi qualifies. 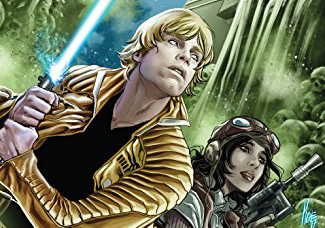 He teams with Aphra because this takes place before he’s encountered Yoda — Luke is looking for something, anything, that will give him more knowledge of the Force, and Aphra has an artifact that could help, the Ordu Aspectum. As she’s the queen of double-crosses, it’s an uneasy alliance. But Luke believes the best of people; no one is past redemption. With a title like The Screaming Citadel, though, you know this story isn’t going to play out as smoothly as young Skywalker would hope. 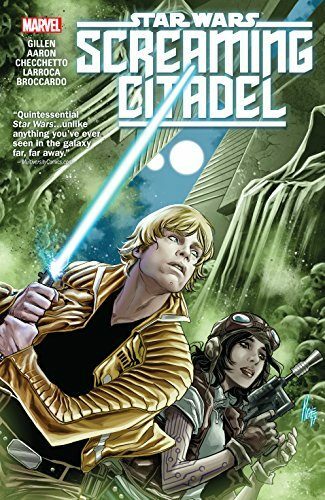 Co-written by regular Star Wars writer Jason Aaron and Doctor Aphra creator Kieron Gillen, the story weaves together everyone you know with Aphra regulars 0-0-0, BT-1, and Black Krrsantan, sort of the mirror universe versions of C-3P0, R2-D2, and Chewbacca. They’ve evil, but not without a certain sense of honor, or in the droids’ cases, reluctant obedience. Like The Last Jedi, the mini-series does take you into unexpected territory, but you’re grounded by the familiar as well. Also like The Last Jedi, The Screaming Citadel offers the potential of the Star Wars universe — it isn’t just about Skywalkers, though they’re good characters too. It is, after all, a universe to be explored, with all kinds of stories within it. This one’s a bit of a horror film, but it’s also consistent with who we claim we want these characters to be. When they veer from that, there’s a legitimate reason within the story, and all the artists who’ve worked on this — Marco Checchetto, Salvador Larrocca, and Andrea Broccardo — still keep them not just recognizable, but recognizable as the original (young) actors. If you want something that’s more directly tied to the movie saga, Marvel offered Shattered Empire, taking place shortly after Return of the Jedi. It also has a direct tie to The Last Jedi, providing the origin of the tree that Luke is reluctantly guarding. It’s all proof that if you really want things the way they were, just like Rey thought she did, it’s all still there in the books.